BDT Private Backcountry Tours combine the very best snow conditions and with the most intimate cultural experiences in Japan. 18 years full time in Japan is why we’re better. From budget to 5 star accommodation, Tokyo tours to private heli transfers, we have you covered. Below are some sample itineraries but as we already mentioned, this is just the beginning. Come join us for a 2 day skills course, formulated for women, by women. Our focus will be to help you gain confidence to split board and ski beyond the resorts and gain knowledge of winter backcountry travel, route finding, safety skills, and trip planning- all in a supportive, fun and encouraging environment led by our professional female guides. Are you looking for the trip of a lifetime for Private Cat Skiing in Japan? Do you have a group that you hand picked to travel with? Or maybe you do not want to worry about a mixed groups ability levels. Experience cat skiing at our Shimamaki location and get ready to ride untouched powder in the Karibayama mountain range! Designed for the most passionate skiers and riders seeking multi-day guided ski trips. This is the type of holiday that you go back to work to recover from. We will put as much into one week as possible with the guarantee that you will be riding the deepest snow on the island. Focussed on the backcountry this trip is for avid backcountry users. As you travel across Hokkaido guests can expect full days in the backcountry following storms, nights sampling local cuisine, and road trips to far flung locations. Welcome to Hokkaido's biggest mountains and most impressive alpine terrain. 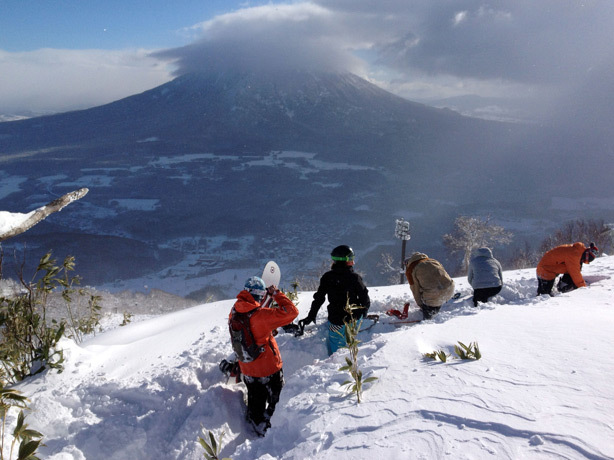 This central Hokkaido trip is primarily a backcountry touring focussed trip well suited to skiers and riders who have already explored the depths of Niseko's powder and want to experience somewhere new. This 14-day Hokkaido ski package takes you from Niseko to the Daisetsuzan National Park and central Hokkaido area in search of powder, steep terrain, and Japanese culture. Utilizing both resorts and backcountry equipment you will experience the locations that have made northern Japan famous amongst powder hunters. This backcountry ski trip is designed to take you a little deeper into the more remote spots around Hokkaido to experience legendary powder and local onsens. After 6 days of ski touring and splitboarding the trips wraps up with 2 full days of cat skiing. Less competition, the deepest snowpack of the year and longer daylight... March is our favorite month. If your forte is a mix of untracked lift accessed pow and incredible backcountry skiing and boarding, March is the month to be here. After a powder filled holiday in Niseko, why not cap things off with a couple new resorts on your way to the airport. If our regular packages don't quite fit your schedule, you would prefer a longer/shorter package or there are other resorts which you would like to visit, let us design a custom tour to meet your needs. The Niseko Guided Ski Trip sets you up with plenty of time to explore Niseko United but, a trip to the powder mecca would not be complete without sampling some of the other legendary resorts and terrain in the area. By the end of your trip you will have experienced at least four of Hokkaido's top powder destinations. This winter BDT is teaming up with Coolstar Limousine services to offer the ultimate Hokkaido ski experience. Depending on your equipment we will get the required rental gear for you or head straight to the trailhead. With our guides leading the way you can expect to find the best skin tracks and powder stashes. At the end of your successful powder day your guide will take you back to your accommodation.